Today's project is light and easy after the hand and finger numbing weaving yesterday. 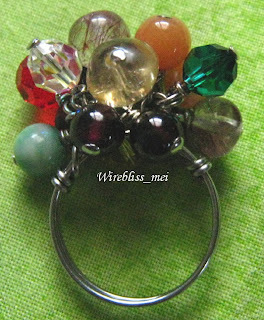 This wire wrapped cluster ring is based on Margo Farrin O'Connor's article in the Step by Step Wire Jewelry Summer Preview 2007 issue. Oh yes, I am taking action in trying out the projects outlined in this issue. Instead of 16g wire recommended in the tutorial, I used 20g for the ring shank. I made three loops (instead of the five shown in her instruction) where the wired beads are attached to (can't be seen in the pictures here). All in all there are 15 wire wrapped beads attached to the three loops (five on each). 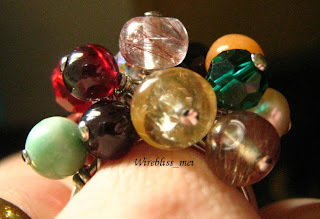 They are a mixture of some of my favorite stones including swarovski crystal, rutilated crystal beads (golden and maroon), garnet, jade, agate, pearl and Czech fire polished glass bead. Henry (my youngest son) likes this ring. Maybe because of the sound it makes when I shake the ring.